Kristen Hess lives in her hometown of Little Rock, Arkansas, but somewhere in the middle she has lived in Brazil, Fort Worth, India, and has visited many other countries, providing countless sources of artistic inspiration. Her parents noticed her natural artistic talent from a young age and learned to carry a sketchbook to every sporting event, restaurant and car ride that comprised the busy life of a family of four kids. Upon the recommendation of an art teacher, Kristen’s parents let her talents develop naturally into her own style as she entered high school. Kristen’s obsession with horses caused her to trace and draw hundreds of horses from every book she could get in her hands. High school art proved to be a time of significant technical development in her art. She learned new styles, used new mediums – including oil paint – and for the first time did art in a community of people, watching and learning from others. Her teacher, Rosemary Parker, selflessly invested time and resources into Kristen’s development, entering her work in local shows, connecting her with other artists, challenging her to break out of her perfectionism in working in graphite to a looser painting style, and ultimately building her up to believe in her own potential. Kristen also credits much of her learning to two other local artists, Barry Thomas and Heike Talbert. Their teaching style and demonstrations helped Kristen learn the principles of painting, color and value while protecting the development of a unique style. These experiences fueled her desire to help people of any culture or status feel the joy of creating something with their own hands. 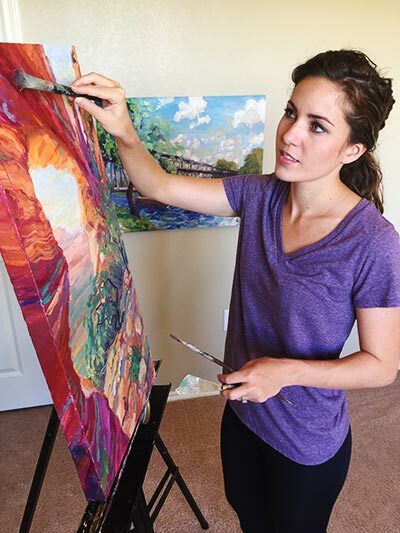 While pursuing a degree in Christian Studies and Spanish from Ouachita Baptist University, Kristen was able to continue painting, though never as a full time endeavor. After college, Kristen spent two years in India, where she taught workshops to Indians and the expat community of Mumbai. She also taught art classes while she lived in southern Brazil. These experiences fueled her desire to help people of any culture or status feel the joy of creating something with their own hands, building their confidence as creative beings, and in some cases introducing skills that the educational system bypassed or viewed as only a luxury for the privileged. Kristen returned from India and moved to Fort Worth, Texas to pursue a Master of Arts in Missiology. Just as learning expands the mind, Kristen’s travel has challenged her to seek to understand other people and cultures. Without understanding, there is never clear communication. Kristen seeks to study and understand God’s creation so that she can communicate the goodness and beauty of the Creator. While studying at seminary, Kristen met the man of her dreams, Dillon Hess, and married him eight months later. Dillon is a gifted web developer and entrepreneur, perfectly providing the left side of the brain for Kristen’s right-brained creativity. The two are committed to serving the Lord anywhere he takes them, eagerly awaiting the great adventures of a life following Christ.